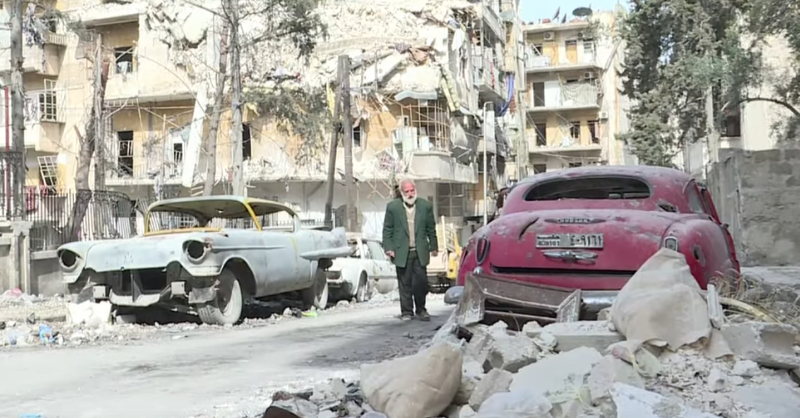 Syrian car collector and enthusiast Mohammed Mohiedin Anis fled his home city of Aleppo last year when the battle for the city intensified as government forces pushed out rebel fighters. He returned this year to find his home and his collection of 30 classic cars in ruins. The 70-year-old’s collection featured dozens of classics from the 1940s and 1950s, and before the Syrian Civil War, Anis had dreamed of opening a Syrian car museum of his collection, according to Ruptly TV. Upon returning to his home after the ceasefire ended the battle for Aleppo late last year, Anis discovered only 13 of his cars remained at the house. Another seven cars had been impounded by police at some point, and the remaining 10 were either destroyed or missing, according to photographer Joseph Eid in an interview with Buzzfeed for his now-viral photo of Anis listening to a record player in his destroyed home. Anis attributes his enthusiasm and interest in vintage cars back to the 1950 Pontiac his father drove, which Anis still owns today. His favorite car in the collection, now heavily damaged, is a 1947 Cadillac convertible he bought at auction, which allegedly was used to transport various foreign and domestic nationals before Anis bought it at auction 12 years ago. Anis attempted to prevent his cars from being stolen by removing seats and steering wheels. Buzzfeed reports that his neighbors stopped rebel fighters from mounting an anti-aircraft gun on a 1958 Chevy during the battle. Images and videos of Anis’ collection show a VW Thing, 1955 Buick Super, 1949 Hudson Commodor, 1957 Mercury Montclair, 1958 Chevrolet Apache, a cargo-van bodied Citroen 2CV, a 1947 Plymouth and various other vintage Buicks and Cadillacs. Anis says he’s refused requests to sell the cars, and instead intends to restore the remaining collection and is even considering expanding it. He says he wants to pass them down to his eight children of his two wives; two cars to every boy and one to every girl, he says. According to the AFP, Anis worked to translate Fiat manuals to Arabic in the 1970s before returning to Syria and starting a cosmetics factory. Anis is a beacon of hope in the ruins of Aleppo; a man who has lost a third of a collection it took him a lifetime to collect. “I have had a very happy past but things have changed,” he said. “Now life is hard, but we mustn’t lose hope.” He also believes no car collection is complete without at least one Cadillac. Best of luck, Anis. Don’t let anything destroy your enthusiasm.